Thursday, 7th of June, 1660. The King to be attended. Letter from Duke of Gloucester. MR. Pryn reports from the Committee for Bills, Amendments to the Bill for preserving the Privileges of Parliament, and confirming the fundamental Laws; which he first read in his Place; and they were after read the First and Second time by the Clerk. Ordered, That the said Bill, with the Amendments, be re-committed to the former Committee; who are to meet at Two of the Clock this Afternoon, in the Speaker's Chamber: And the Gentlemen of the Long Robe are enjoined to attend at the said Committee. The House this Day resumed the Debate upon the Act of general Pardon and Oblivion. Resolved, That this House doth declare, That, in the Name of themselves, and of all the Commons of England, they do lay hold of his Majesty's free and general Pardon, tendered in his gracious Declaration, given under his Majesty's Sign Manuel and Privy Signet, at his Court at Breda, 4/14 April, 1660; with Reservation, to except such Persons as shall be excepted by this present Parliament, in the Act of general Pardon and Oblivion. Ordered, That it be referred to a Committee to withdraw, and pen a Declaration to this Effect, and forthwith to report it to the House; and that Sir Heneage Finch, Serj. Hales, Mr. Annesley, Serj. Maynard, be the said Committee. The Examination of John Coke Esquire, taken before John Bysse, Recorder of Dublyn, the Eighth of May, 1660, was read. Resolved, That John Coke Esquire be excepted out of this Act of general Pardon and Oblivion, for Life and Estate. Resolved, That Andrew Broughton be excepted out of this Act of general Pardon and Oblivion, for Life and Estate. Resolved, That Edward Dendy be excepted out of this Act of general Pardon and Oblivion, for Life and Estate. Mr. Annesley reports the Examination of Leonard Watson, touching the Person who executed the late King; which was read. Resolved, That those Two Persons who were upon the Scaffold in a Disguise, when the detestable and traiterous Sentence upon the late King was executed, be excepted out of the Act of general Pardon and Oblivion, for Life and Estate. Resolved, That Mr. Hugh Peters, and Cornet Joyce, be forthwith sent for, in Custody, by the Serjeant at Arms attending this House. 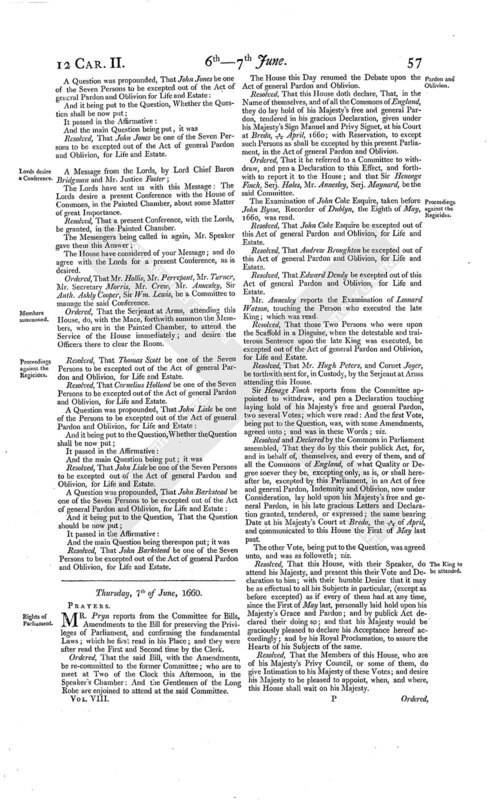 Sir Henage Finch reports from the Committee appointed to withdraw, and pen a Declaration touching laying hold of his Majesty's free and general Pardon, two several Votes; which were read: And the first Vote, being put to the Question, was, with some Amendments, agreed unto; and was in these Words; viz. Resolved and Declared by the Commons in Parliament assembled, That they do by this their publick Act, for, and in behalf of, themselves, and every of them, and of all the Commons of England, of what Quality or Degree soever they be, excepting only, as is, or shall hereafter be, excepted by this Parliament, in an Act of free and general Pardon, Indemnity and Oblivion, now under Consideration, lay hold upon his Majesty's free and general Pardon, in his late gracious Letters and Declaration granted, tendered, or expressed; the same bearing Date at his Majesty's Court at Breda, the 4/14 of April, and communicated to this House the First of May last past. The other Vote, being put to the Question, was agreed unto, and was as followeth; viz. Resolved, That this House, with their Speaker, do attend his Majesty, and present this their Vote and Declaration to him; with their humble Desire that it may be as effectual to all his Subjects in particular, (except as before excepted) as if every of them had at any time, since the First of May last, personally laid hold upon his Majesty's Grace and Pardon; and by publick Act declared their doing so; and that his Majesty would be graciously pleased to declare his Acceptance hereof accordingly; and by his Royal Proclamation, to assure the Hearts of his Subjects of the same. Resolved, That the Members of this House, who are of his Majesty's Privy Council, or some of them, do give Intimation to his Majesty of these Votes; and desire his Majesty to be pleased to appoint, when, and where, this House shall wait on his Majesty. Ordered, That the Committee appointed to manage the Conference with the Lords Yesterday, do make Report of the said Conference, had with the Lords, Tomorrow Morning. 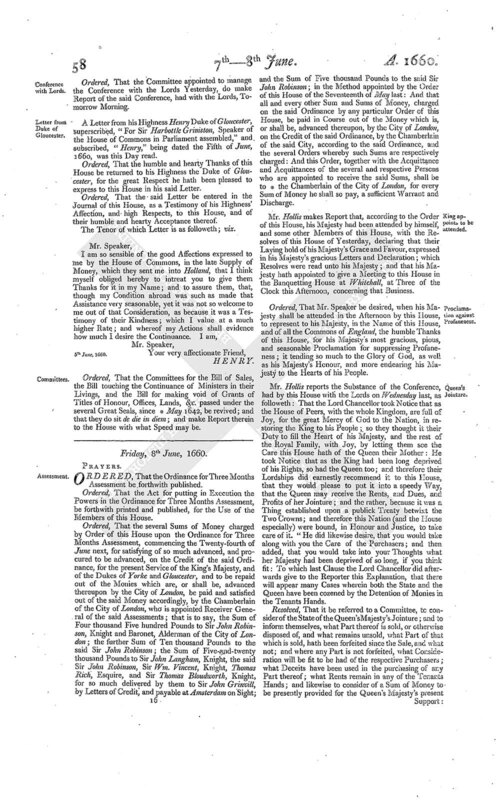 A Letter from his Highness Henry Duke of Gloucester, superscribed, "For Sir Harbottle Grimston, Speaker of the House of Commons in Parliament assembled," and subscribed, "Henry," being dated the Fifth of June, 1660, was this Day read. Ordered, That the humble and hearty Thanks of this House be returned to his Highness the Duke of Gloucester, for the great Respect he hath been pleased to express to this House in his said Letter. Ordered, That the said Letter be entered in the Journal of this House, as a Testimony of his Highness' Affection, and high Respects, to this House, and of their humble and hearty Acceptance thereof. The Tenor of which Letter is as followeth; viz. Ordered, That the Committees for the Bill of Sales, the Bill touching the Continuance of Ministers in their Livings, and the Bill for making void of Grants of Titles of Honour, Offices, Lands, &c. passed under the several Great Seals, since * May 1642, be revived; and that they do sit de die in diem; and make Report therein to the House with what Speed may be.